Imagine a life free from anger. Much more than mere anger management. Stop being so angry and be calmer. Get your life back under your control. Hypnotherapy & NLP – help for anger. Don’t let temper win, contact us today. The idea of ‘anger management help’, is one that we personally don’t like, as there is a presupposition that someone must be angry, and then find a way of managing that anger. It is far better, in our opinion, rather than just to manage your anger, simply not to be angry in the first place. The emotion ‘anger’ can be destructive in many ways. It is normal to feel angry from time to time, though anger is rarely a useful feeling. Anger is very often followed quickly by remorse, though sadly the ‘damage’ has already been done. When someone repeatedly feels anger over a particular issue or issues it tends to put that person in a state where they are not best placed to deal resourcefully with the situation. More often than not, this is simply a habit. Anger can manifest in many different situations. Sometimes it begins with a relatively minor event which then goes round and round in someone’s head, and then other little things get on their nerves and it builds, slowly, until anger erupts. Sometimes the person arrives home stressed after work (or has had a stressful day looking after children), and everything gets on their nerves. Sometimes the anger is linked to drink or drugs. Some people get really angry every day, some just explode into rage once or twice a month. Sometimes people suddenly explode into anger from seemingly nowhere. Very often it is the person’s partner (or children) that suffer the brunt of the emotion. Sometimes an otherwise fairly placid person will become a ‘demon’ in certain situations, like behind the wheel of a car, the road rage syndrome. Sometimes it is useful to see both partners in a relationship, rather than just the one. We work using two broad strategic approaches that both teach you HOW to move away from anger and help you to feel calm and resourceful at times when you may have been overcome with emotion, and also, by using hypnotherapy, we help you to re-pattern these responses at a deeper, and a more automated level. Our approach is direct and pragmatic. Rather than simply give you ‘anger management’ techniques, the aim of our work is to help you to rapidly recondition the old way of being and to build more choice into your thinking in the present. Good results can be both rapid and easy to achieve. Moreover, because we waste no time going over the past, or talking about you childhood, your parents etc etc, and instead focus upon dealing with the problem as it arises in consciousness,we aim to get useful results quickly. As a footnote, we have sometimes seen clients whose problem was that they became irrationally furious if someone was to chew loudly, or clear their throat, or cough. This single-trigger anger can respond very well and very quickly to hypnotherapy and NLP. This will vary from person to person but we always aim to make useful changes from the outset.. These self hypnosis recordings provide much more than just ‘relief’ and are recommended for anyone in a highly emotional state. We are so confident that they will help that If you don’t find them useful we will give you your money back. 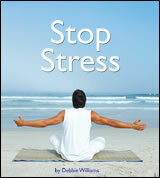 Much more than simple stress management. Debbie will teach you to focus on solutions, which naturally will calm you eliminating stressful responses. For example the use of more empowering questions such as ‘What do I need to learn from this to move on?’ will enable you regain control and develop a happier and more relaxed outlook.